For this trip, I stayed at the Little Nell hotel. The Little Nell is perfectly situated at the base of Ajax, and the “ski concierge” is the ultimate in ski service. Friendly staff are on hand to take your skis and boots at the end of day, and set them up for you in the morning. The gondola is a mere 100 feet away from the ski concierge “hut.” The Little Nell is pricey for what you get, but if you want to splurge, then it, and the St. Regis, are the places to do so. More affordable places to stay are the Gant Condos and Limelight Hotel. For places to eat in Aspen there are many options. My favorite is still Cache Cache. 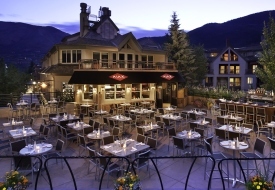 However, I also enjoyed Brexi Brasserie (www.brexiaspen.com) and Il Mulino (ilmulino.com/aspen.html). Casa Tua (www.casatualifestyle.com/aspen) opened up a restaurant in Aspen (they have a lovely one in Miami) but I must say that the Aspen meal I had was not at all worth it. Casa Tua is a beautiful restaurant that warrants much better food. For après-ski, consider Ajax Tavern (pictured at left) at the Little Nell. If the sun is out, you will get a nice tan on the terrace; enjoy a glass of Veuve Cliquot which seems to be their sponsor. The Ajax Tavern’s terrace is a good spot for people watching too – and there is much to watch, from those in their full length minks to men with cowboy hats and Rolex watches to women in heels (yes, next to the slopes). It reminds you that Aspen is very much a place to be seen (at least in the high season). While the tourists flock from all over the country and the world, the staff working in Aspen, who could not be nicer, also hail from all over – South America, Europe, Australia, South Africa, and parts of the U.S. Some travel tips in Aspen: If you plan to fly into Aspen Airport, be prepared for a possible diversion to Grand Junction if there is bad weather (which means getting bussed to/from Aspen; 2.5 hours away). To make the most of your time, ski a half day on your last day in town, arrange a late check-out, and then head to the airport. Finally, bring some Tylenol. The high elevation is likely to cause a headache the first night or two. But the trip is worth it! For general trip-planning info see our Aspen destination guide, then use our Travel Search price comparison tool to find the lowest rates on flights, hotels, vacation packages, and more travel deals to Aspen.